The Emergence of "Calling Me Home"
Hi Folks, the big news this week is the arrival of a new recording of mine called “Calling Me Home.” If you’ve been out to hear us perform over the last year or so you’ve heard us play a bunch of these tunes. It’s a thrill to have them out now escaping into the world on a CD. Here’s the whole story. That's me in Del Mar at thirteen years old in a full spirit football throw. “Sarah’s Island” features Kevyn Lettau on vocals and tells the story of how an island, through its natural beauty and gentle trade winds, helps to bring the life back into a slightly worn out individual. If you’ve ever traveled to the end of the road on the north side of the island of Kauai, you’ll know how the healing qualities of aloha can take hold. “Cantar” is a samba tune that Kevyn Lettau and I wrote together years back and for this recording it features Allison Adams Tucker on vocals. We play this cool 5 against 4 rhythmic phrase at the end of the guitar solo and this was inspired by the gifted Ron Satterfield who played with us back in the late 80’s. “Rain” features Lisa Hightower on vocals and this is one of my favorite moments on the CD. I first wrote and recorded this song as an instrumental on my “Light Dance” recording in 2001. Later on Randy Phillips added the words and I think we’ve captured some true beauty in sonic form. “To Live in the Heavens” features Kate Fuller on vocals. The song evolved out of a moment when I was stuck in a horrendous traffic jam, looking up at the clouds and thinking, there must be a better design to living than being trapped in an overheated, pinned-in car. Indeed there is and this song transports us to one possible option. “Mudra” first had a life as an instrumental and we recorded it on my “The Wild Blue” CD featuring Carter Dewberry on cello. It’s always been one of our favorites for the group. Randy loved the song and later came up with this lyric telling how, through our hands, musicians share stories of wisdom and peace through their music. A mudra is a symbolic or ritual gesture in Hinduism and is mostly performed with the hands and fingers. This song features Leonard on vocals. The song on the CD is “Calling Me Home” featuring Leonard on vocals. I was listening to a Ray Charles recording when I came up with this song. We first recorded an instrumental version on my “Taking It All In” recording. Randy later filled in the missing details with her words and every time I hear it, I’m transported to that old tree, gazing up to the sky, and thinking about the warmth of home. The other players on this recording are Gunnar Biggs on bass, Duncan Moore on drums, and Tom Aros on percussion. On the tune “Calling Me Home” Josh Nelson is added on piano along with Darek Oles on bass. To check out the new recording go here. You can hear a 2 minute sample of each tune and see if it’s working with your ears. If you do want to venture further and buy the music you can get it either as a CD or as downloadable mp3’s. 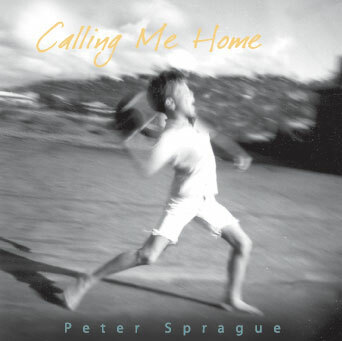 Also, the sheet music for all of the songs on “Calling Me Home” are available on my site in downloadable PDF form. Go here to hunt them down. 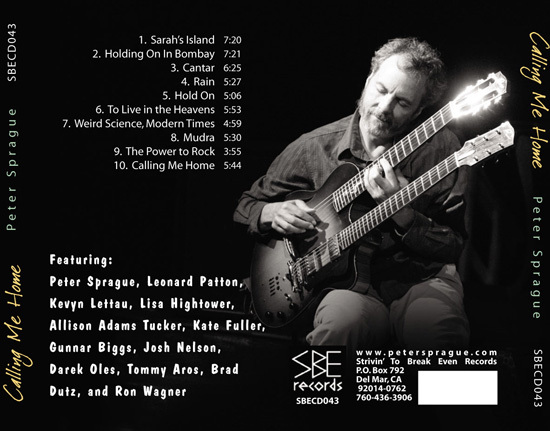 This is the albums back cover with a great photo by Kevin Kinnear and the design work by Barbara Rix. 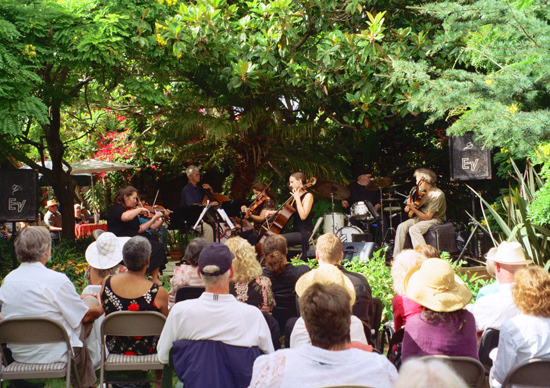 The outdoor String Consort show in Encinitas over the weekend went beautifully. The group sounded great and it was an exciting moment playing the new piece at performance tempo. Super fast and tricky! Thanks to all that made it out for the music and great food. Thanks to Lauren, Ken and Therese for making all of the details dovetail. A group photo after the concert. From left to right, Bob, Duncan, Lauren, Peter, Therese, Pam, Carter, Jeanne and Bridget. Now this is where inspired music is made! Love the surroundings. The string group rehearsing in paradise. For this week on Thursday evening Leonard, Tripp and I are heading over to the San Diego Botanic Garden in Encinitas for a night of music set in an amazing environment. We’re jamming in a space on the lawn surrounded by beautiful trees and plants and hopefully you too. Can’t wait! Also up this week is a show at the Roxy on Saturday night with vocalist Keyvn Lettau and myself. We’ve been doing this once a month and it’s huge fun. Kevyn sounds fantastic and we freely tour through our favorite jazz tunes and Brazilian gems. Hope to see you there. Looking ahead, on July 30 guitarist Fred Benedetti along with my brother Tripp and myself, collectively known as Blurring the Edges, are playing a special house concert in Encinitas. House concerts are magic inventions and just maybe will be the wave of the future for live music. Look below for the details and hopefully it can work out for you to be there. 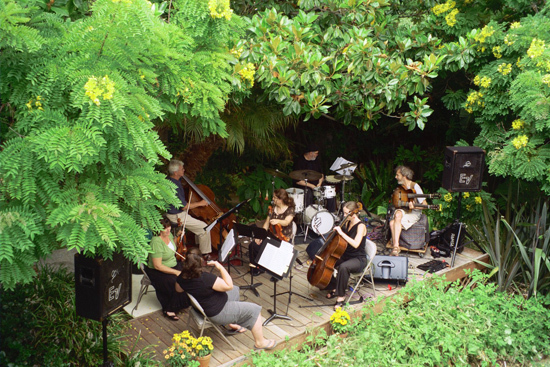 Tripp Sprague  sax and flute 6 PM Playing some trio music in a magical spot! Kevyn Lettau  vocals 7 PM Connecting up with jazz vocalist Kevyn Lettau for a magic evening at the world famous Roxy. 7 PM Solo guitar is one of my favorite musical vehicles to ride in. All aboard! 7:30 PM It'll be great to connect with maestro Benedetti and bro Tripp for a magical concert in the lovely home of Julie Chippendale. We'll have intermission desserts too. Terryon Gulley  drums 6 PM Up to the high mountains of Colorado to play a hit with the amazing Dianne Reeves. 7:30 PM Vocalist Kate Fuller and I are playing together for another intimate house concert. This is a really cool setup for a show in the lovely home of John and Kim and it'll be a magical evening with some intermission desserts. 8 PM Chris is a gifted young saxophonist who is heading of to Berklee School of Music and this will be his send off concert. He's really good! 7 PM The LA gig with Kate got moved so I'm happy to be able to play the Roxy instead. Solo guitar is one of my favorite musical vehicles to ride in. All aboard! 7 PM Geoffrey Keezer told me about this gig and I'm stoked to be sharing the vibe in Missoula, Montana. Do you know anyone that lives there? 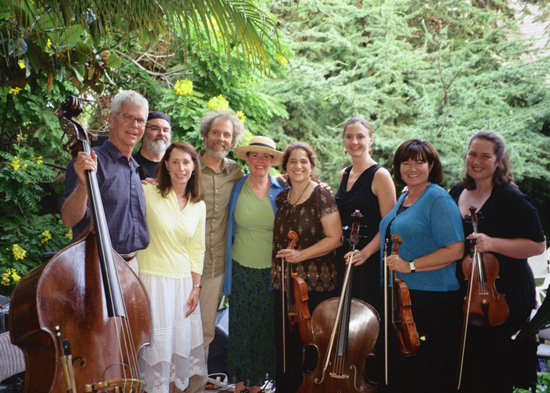 Bob Magnusson  bass 7PM What a hoot bringing the string group to play the Tango. It'll sound great in there! Bob Magnusson  bass 1:20 PM Taking the Consort to the tree bliss of Idyllwild! 3 PM Not sure on the details for this one but I'll post the info a little later on. Peter Sprague  guitar 8 PM Jaime plays beautiful violin and this will be a night of her music.